Starting July 19, you can help Seminole County Public Schools students in need get a head start through Tools 4 Seminole Schools and Publix. Visit any Publix location in Seminole County through August 4 and participate in the “Tools for Back to School” campaign. By contributing $5 or more, you’ll ensure that much needed learning tools will be donated to Tools 4 Seminole Schools…and those supplies will go to our hard working teachers for their students in need. Be sure to spread the word to friends and family that Publix is the place to shop and donate this back-to-school season, plus, you’ll receive a free reusable bag! Thanks to Publix and supporters like you, we can ensure students have the supplies they need to be in school, ready to learn. 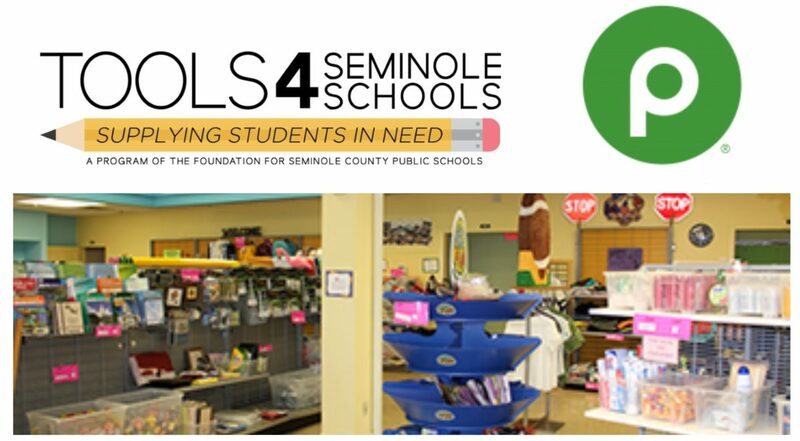 The Tools 4 Seminole Schools store is funded through The Foundation and primarily supported by grants, corporate giving, individual donors and our annual supply drive every summer. Local businesses, community organizations and individuals collect thousands of schools supplies to keep the shelves stocked all year long. Publix’s Tools for Back to School is benefiting Seminole, Orange and Osceola Counties through Tools 4 Seminole Schools A Gift For Teaching, and A Gift For Teaching Osceola, who each provide free school supplies to teachers for students in need.